By now you may know I’m a passionate pesto lover! Basil, rocket, spinach – anything green with nuts, olive oil and garlic, parmesan cheese and freshly cracked black pepper and I’m there! Hope you like this one – we love it! 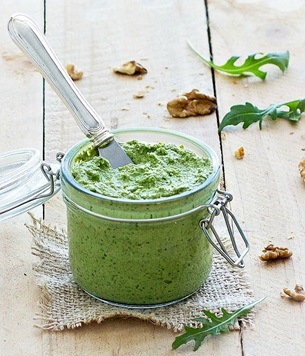 I’ve made many rocket and walnut pesto’s in my time, here’s my latest favourite. • This will keep for 5-6 days in the fridge if it’s well hidden….